Pinchmedia provided new report of prices for IPhone application in AppStore. The percentage of applications that are free is falling. However competition among paid applications is leading to price cuts - the most common price is $0.99. Almost 69% of paid applications are now $4.99 or less. $9.99 remains the second-most popular price. As of this morning, Pinch Media tracked 798 applications in the AppStore - 161 (20.2%) free, 637 (79.8%) paid. 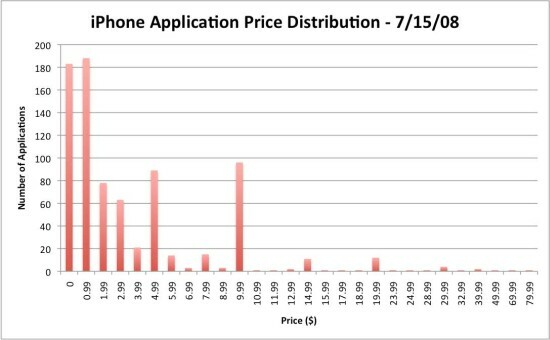 Compare them with the ones, that were presented a week ago just after the AppStore opening: IPhone application price. These two libraries that are needed for Java on IPhone were updated recently. Downloads are avaliable through Cydia Installer. Jocstrap is a bridge between Java and Objective-C. UICaboodle is a JocStrap extenstion for the IPhone. Both are needed to write Java applications for IPhone. JamVM - Java Virtual Mashine for IPhone, has been updated. New version 1.5.1b2-17 is avaliable through Cydia Installer.